I am delighted to be here again to speak to you at this inaugural session of the Concluding Conference of the programme on"Cooperative Development, Peace and Security in South and Central Asia”.I fondly recall visiting CRRID as External Affairs Minister to deliver the P.N. Haksar Memorial Lecture and as Finance Minister to chair a conference on this topic. 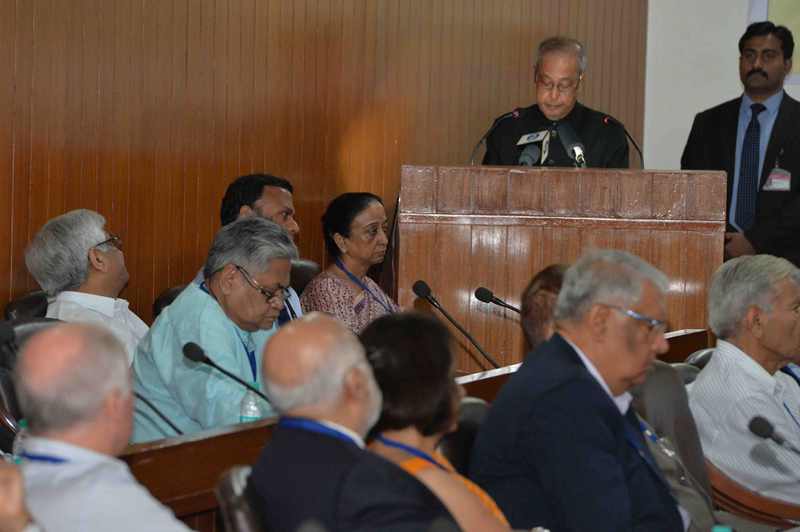 I am aware that this programme has traversed an eventful and productive journey, having begun in the mid-1990s, with encouragement from then Vice-President Shri K.R. Narayanan, then Finance Minister and later Prime Minister Dr Manmohan Singh and Shri P.N. Haksar, the Chairman of CRRID since its founding in 1979. I would like to commend CRRID for piloting this programme. I am also happy to note that since 2011, MEA has provided support to CRRID in this regard. This is important as co-opting think-tanks and research institutions to provide independent inputs on foreign policy making is an essential ingredient for success in pursuing India’s long term interests in the international arena. I recall that as External Affairs Minister, I was seriously concerned about the depth of Policy Planning in the MEA because of the lack of human resources that could be deployed for this task. I am, therefore, happy to note that the Ministry of External Affairs has initiated a series of steps to strengthen its Policy Planning Division by attracting talent from within the MEA, other departments, and from academia. While doing so, the Ministry continues to lay emphasis on working with think-tanks and research institutions such as the CRRID to strengthen its outreach and to provide independent and intellectual inputs on foreign policy formulation for the country. The think-tank community, too, must adjust, redefine its role and bear the new responsibility better. It is important that they keep abreast of the increasingly dynamic context of India’s global engagement, and ensure that while they continue to pursue academic works, they do not lose sight of policy relevant research which helps to create a menu of policy options for MEA. The primary goal of India’s external engagement has been to seek peace and stability, enabling a supportive environment for pursuing our nation’s multifarious development needs. It is only in a congenial and conducive international environment that India can pursue its core interest of transforming India into a modern nation and meeting its enormous challenges of development. Pandit Nehru, the architect of India’s policies in the early decades of independent India’s journey, firmly enshrined these goals in our country’s quest for fulfilling its destiny as an independent nation. These objectives remain relevant even today. If anything, they have assumed greater salience after the economic liberalisation initiated in 1990s. In an increasingly globalised and inter-connected world, foreign policy has essentially become a tool to pursue cooperative relationships for greater prosperity and well-being of their citizens. Security objectives remain relevant, and I do not wish to undervalue them, but they remain important largely in the context of the need to ensure a peaceful and stable environment for all round welfare and development at the regional and global level. This approach of foreign policy for economic progress and development is nowhere more relevant than in our South Asian neighbourhood and the extended neighbourhood, including Central Asia. Both South and Central Asia face enormous challenges with regard to development as well as security. These range from ensuring economic growth and stability to dealing with trans-national security threats such as the scourge of drug-trafficking and terrorism. Our approach to both the regions has been to build bridges of friendship and cooperation, establish greater physical and people-to-people connectivity and foster closer integration for overall progress and well-being. South Asian neighbours are clearly our highest priority in keeping with our neighbourhood first policy. Our approach to South Asia has always been one of seeking shared prosperity and security. Our South Asian neighbours are our most indispensable partners. However, it is also a fact that the region remains amongst the least integrated and developed. Clearly, there is need for greater effort and energy to meet our many shared challenges. I am happy to note that the present Government has laid the required emphasis on pursuing closer fraternal ties with our South Asian neighbours from the very first days of its existence. This was reflected in the invitation to leaders of SAARC countries and Mauritius to attend the swearing in ceremony in May 2014. Since then, we have witnessed high level visits to and from virtually every country in the region. The Government has also articulated a desire to pursue a policy of three Cs – greater connectivity, closer cooperation and broader contacts to promote closer ties in the region. It has conveyed a clear message that India wishes to use its size and scale to pull the entire sub-continent along on the path to growth and development. Grow together is the philosophy of the day. All this has yielded positive results. The resolution of the decades old Land Boundary Agreement and settling the Maritime Boundary with Bangladesh, supply of water to the Maldives suffering from breakdown of water supply system, India’s immediate assistance to Nepal after the devastating earthquake, continuing its close cooperation with Bhutan, and pursuing proactive cooperation with the new government in Sri Lanka have all signalled India’s willingness to pursue this strategy. With Pakistan, our efforts have not yielded the desired progress for reasons that are known to all of you. Beyond bilateral cooperation, SAARC remains the main plank of our integration strategy with our South Asian neighbours. The last SAARC Summit in Kathmandu in November 2014 saw announcement of several unilateral initiatives by India including a SAARC satellite, easing of travel to India, up-gradation of SAARC Supra-National Laboratory, making available India’s National Knowledge Network to SAARC countries and Special Facility to fund infrastructure/connectivity projects in SAARC countries. The SAARC Framework Agreement for Energy Cooperation (Electricity) was also signed to facilitate cross border electricity exchange. However, the South Asian landscape and its geo-politics present its own set of challenges. Despite geographical contiguity, the promise of regional integration has eluded us and undermined the goals of SAARC, solemnly adopted at Summit level meetings. Hence, India must push ahead with sub-regional cooperation such as through the BBIN Growth Quadrangle and pursue its bilateral ties with like-minded countries in the region in areas such as Road Transport, Energy and Water Resources. The Motor Vehicles Agreement within the BBIN framework and pursuing the first ever international oil pipeline in South Asia with Nepal are examples of concrete forward movement in this regard. Turning to the Central Asia, we have historical, cultural and civilizational linkages with the countries in the region. However, while India enjoys goodwill and a cultural connect with the Central Asian nations, the lack of physical connectivity so far has hindered the realisation of full potential of trade and economic cooperation with the region. The visit by Prime Minister to all the five Central Asian states countries in the region in July this year has provided the much needed impetus to our "Connect Central Asia” policy. This policy was launched in 2012 to enrich our contacts with the region. We share two main interests with countries in the region – security and counter-terrorism on the one hand; and mutually beneficial economic engagement including in the use of energy and natural resources on the other. Central Asia also provides opportunities for closer cooperation in other sectors such as education, culture, tourism, health, banking, agriculture, pharmaceuticals, textiles, engineering and Science & Technology. India’s entry into the Shanghai Cooperation Organization (SCO) recently is also part of this deepening engagement with the region. Our ongoing efforts at examining the possibility of an FTA with the Eurasian Economic Union will also further deepen our integration with the region. Even as we pursue closer cooperation with the region, we must remain cognisant that our ties have been the closest and mutually beneficial only when we have had established routes of connectivity with each other. In this regard, we need to make full use of the opportunities offered by the recent Iranian nuclear deal which opens the possibility of establishing connectivity with the region through the development of Chahbahar Port in Iran. This also opens up the possibility of implementing the International North South Corridor for a competitive and quick route to Eurasia for India. India’s future dependence on imported energy, mainly oil and gas, is a stark reality that will also require creative and diversifying sources of supply. The Central Asian States have considerable surplus and the TAPI pipeline project is worth pursuing both for sourcing energy supplies and its collateral geo-strategic benefits. The Iran-Pakistan-India (IPI) gas pipeline can also be revived since Iran has already built the section of the pipeline in its territory. Such energy projects could also prove to be game changers for geo-strategic stability. As I had mentioned earlier, CRRID and similar institutions play a crucial role in independently analyzing these aspects and presenting the foreign policy establishment with alternative roadmaps for the future. I congratulate CRRID for providing support for India’s foreign policy effort since 1982. I wish it and all scholars associated with CRRID the very best for their future efforts. I have the pleasure of declaring this conference open. I am confident the deliberations during the conference will significantly add to the corpus of intellectual output that will help India in the making of our foreign policy.